The pass laws were designed by the apartheid government to tighten state control over the movement of black South Africans. For many years there was tension inside the African National Congress (ANC) between those with more moderate views and those with more 'Africanist views' - An ideology that says that black people should determine their own future - Africa for the Africans. It was first expressed by a Xhosa missionary, Tiyo Siga, in the 19th century. Tension became more pronounced with the Freedom Charter, which was accepted by the ANC in 1955, and the years of harassment that followed. The Africanists found the Freedom Charter too moderate, and felt that they should focus more on black needs. In November 1985, at the Transvaal provincial congress, some Africanists were excluded from the hall. Rather than cause confrontation, they decided to break away, and in March 1959 the Pan Africanist Congress (PAC) was formed. They elected Robert Mangaliso Sobukwe as their first chairman and Potlako Leballo as secretary and decided to follow the route of the Programme of Action and Defiance Campaign. Members of the PAC were also not happy with the multi-racial character of the ANC. There was a lot of competition between the ANC and the PAC as they both wanted support from the same group of people. In December 1959 the ANC planned an anti-pass campaign for 31 March the following year, and the PAC decided to organise a similar campaign before this date. The anti-pass campaign turned out to be very important for the PAC, and for South African politics in general. The date for the campaign was finalised on 18 March, and set for 21 March 1960. The weekend was spent spreading pamphlets about the campaign and calling on people to leave their passes at home and offer themselves for arrest at police stations. The protest was of a non-violent nature, but turned violent in Sharpeville where police opened fire on a crowd of protestors, killing 69 and injuring 180. In Langa, near Cape Town, the police also opened fire and killed two people. PAC member Philip Kgosana led a protest march in Cape Town two days later. 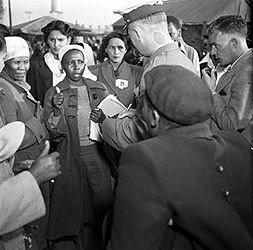 The Sharpeville Incident resulted in international criticism and concern and increased suppression from the National Party (NP) government. The negative thing for the PAC was that Sobukwe had also taken part in the campaign, together with other leaders of the PAC, and they were all placed under arrest. Many other leaders were arrested in the aftermath of the incident, not to be released for between two and three years. Sobukwe was not released until 1969. A state of emergency was declared on 30 March after other marches in Cape Town and Durban. As a result of the Sharpeville Incident both the PAC and ANC were banned in April 1960.